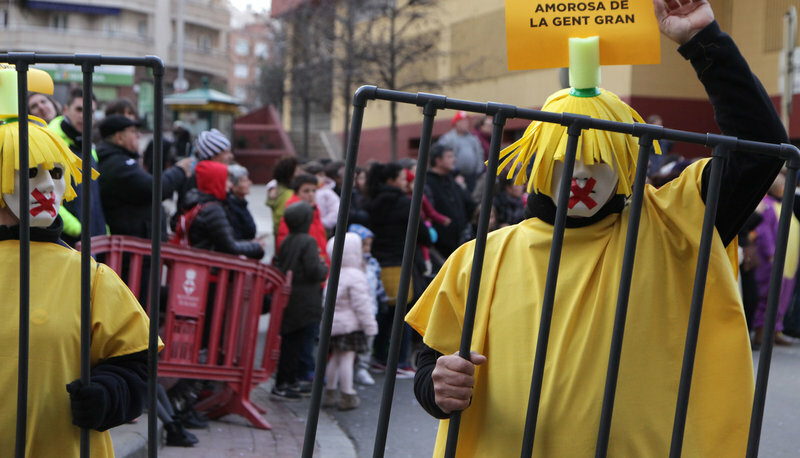 Carnival protesters in Blanes. JOAN SABATER. The trial has been described in hyperbolic terms – the trial of the century, and so on – and that seems about right. It is a big deal. While I wonder how things ever got this far, I suspect the answer lies in the spectacular (that word again) mishandling of the whole political situation in Catalonia by both sides. Then again, what’s to wonder at? A showdown in the form of a show trial fits with how things have gone so far. First we had years of hundreds of thousands flooding the streets in Catalonia dressed up in bright clothing, waving coloured placards, jubilant at the chance to openly express their dissatisfaction with the establishment, revelling in a shared experience that always had a carnival atmosphere to it. Politics can be all about spectacle and the declaration of independence in the Catalan parliament on October 27 following the referendum was another example, with smiles and hugs and more people celebrating on the streets. What could go wrong? One aspect of carnival is it is supposed to be a time when the established order is turned upside down, when the elites are mocked and the plebs get to run things for a while. No need for cool heads during the carnival, it is time for society to let its collective hair down and throw caution to the wind. But if carnival served a purpose in the medieval societies in which it developed, it was as a valve to let off steam. After a year of being bossed around and living in a house made of mud, this was a time to show the high-ups the middle finger and get away with it. But the catch is that once it’s over you go back to the plough and tugging you forelock whenever your betters pass by. Now we face months of a real-life televised court drama, like the OJ Simpson trial on steroids. While it’s likely that the image of the Spanish state will not come out of the whole spectacle unscathed, it could not pass up the opportunity to make an example of those who defy it. Public hangings used to be as popular as football matches, and just think about ’criminals’ thrown to the lions in the Colosseum while the crowds munched on the ancient equivalent of hot dogs. These public spectacles orchestrated by the authorities are worth the risk of falling foul of the media and public opinion because they send the most important message of all from the point of view of the authorities: don’t even think about it or this is how you’ll end up. Now shut up, finish your hot dog, and get back to work .